New iOS email apps these days seem split between those that want to make your inbox as simple as possible (Mailbox, Inbox by Gmail) and those throw in as many power features as possible. Microsoft’s Outlook fits that second bracket, as does Spark, a new app from popular developer Readdle. A neat feature is the ‘quick replies’ you can send – very useful if you get a lot of email, although I’m not sure what people who don’t use the app will make of receiving replies that look like the ones below (and double up as a clickable ad for the app), but when chatting to Readdle’s Denys Zhadanov about the app via email, it was nice to sometimes reply with a simple tap rather than having to type out ‘thank you very much,’ or another quick, polite message. 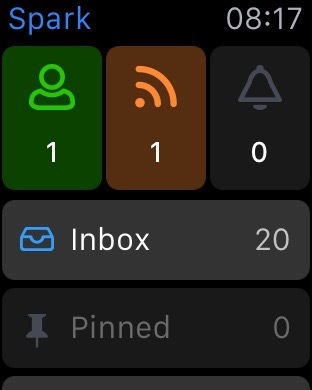 There’s Apple Watch support, with an app that cleanly summarizes the current state of your inbox and allows you to read and reply to emails from your wrist. It’s as well-executed as you’d expect from an app launching after the developers have actually had a chance to play with the Watch, unlike many of the apps that launched a few weeks ago. In addition, there’s natural language search (try “PDFs in the past month,” for example) and a calendar widget for checking your schedule when arranging appointments. Finally, there’s integration with cloud storage providers like Dropbox, note-keeping services like Evernote and read-it-later services like Pocket for you to try. 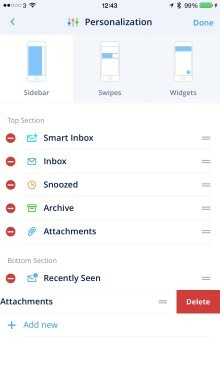 One problem I found was that the app’s ‘snoozed’ email (where you’ve set a message to come back to you at another date) doesn’t work as well as rival apps like Mailbox. An email I snoozed in Spark came back to my inbox at the right time – but only in Spark. It only appeared in my inbox in other apps after I’d opened it in Spark first. Zhadanov says that this is “because we don’t use external servers to store your email for security reasons, so everything happens on the client/app side.” He did note that this may change in the future so that the app can take advantage of features that could only be added using external servers. The email app market is crowded at the moment. Just yesterday Google opened Inbox by Gmail to everyone, and Outlook has attracted a lot of fans. So, Readdle may have to fight particularly hard for attention but if you’re serious about your inbox it’s worth a try.